Question: What tips can you give when fitting bodywork? 1. Loosen off all brackets, stays and fasteners before trying to fit bodywork and it will be a lot easier. Many bikes have been crashed and the above mentioned parts are not straight. Combine this with the various positions for mounting each piece (e.g. Meter stay can be moved up and down about 10mm, frame side stays can be moved back and forward as well as up and down) and it becomes much less of a task to get the panels to fit. 2. Always protect edges with masking tape if they are likely to get knocked when fitting the bodywork. Remove the tape once the panel is in place being careful not to lift the paint too. 3. Measure and check the position and remeasure before drilling any holes. 4. Use large headed screws, preferably with plastic or at least steel washers to protect paintwork. 5. Use a little Locktite on the threads of fasteners to prevent them working loose and getting lost. Question: Is tyga-performance bodywork predrilled? Answer: Most of our products are predrilled for ease of assembly. 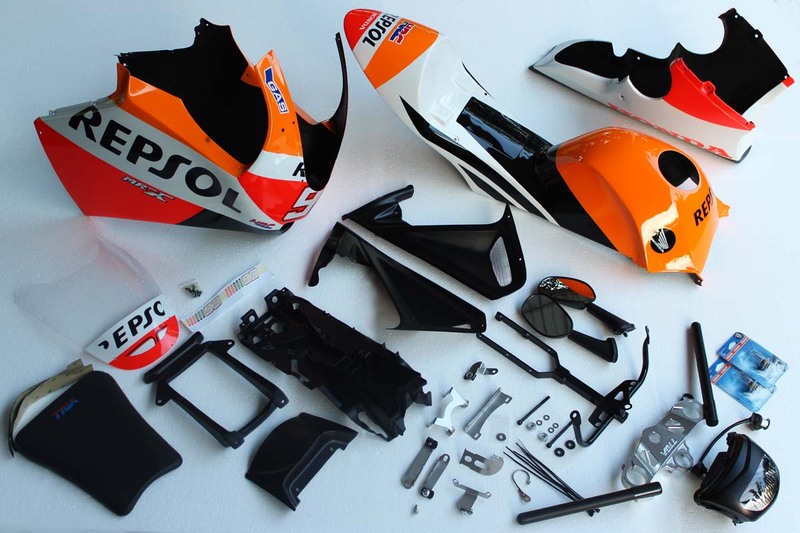 There are some exceptions such as front positions on some fairings which we leave to the customer once they have adjusted everything to the right place. also, with our race bodywork, we know some racers prefer to use a particular fastener so we mark but not drill some positions on the bodywork. Question: What is TYGA Performance bodywork made of? Amswer: TYGA bodywork is made from GRP, (glass reinforced plastic), otherwise know as fibreglass. We use high quality cross weave mat for an attractive and strong construction. The panels are strong and lightweight and nearly all our products now utilise high quality epoxy resins which allow for great flexibility without damage. TYGA Performance GRP products are NOT gel coated. This avoids nasty spider webbing commonly seen in fibreglass panels. Some preparation will be necessary before painting. Question: Will TYGA bodywork panels fit other models than specified? Answer: In most cases, some modification is necessary to get the panels to fit models other than specified. In particular, seat cowls are very specific to the model they were intended for. Upper cowlings are the easiest to get to fit on other models, but lowers are not so easy due to exhaust, side stand and kick start clearance issues. If you buy our products for a model that it is not listed for, be prepared for some cutting and grinding. Don't say we didn't warn you! Question: When is TYGA Performance going to make a seat cowl for my CBRRR? Question: How legal are the lighting systems you provide in your kits? Answer: The units we use are OEM systems and comply with some countries regulations. We are happy to offer advice on your specific needs if you send us an email with your questions. However, this is only advice and regulations vary from country to country and we can not guarantee compliance. Please contact your local regulatory authority for advice. Question: Do the headlights conform to EU or US regulations? Answer: The headlights on our products have not been tested to comply with international regulations. TYGA Eyes I, II and III and Spark headlights are both effective and give good spread of light and intensity, similar to the OEM NSR headlight units. The GP250 headlight is less effective but it is still acceptable (similar to a moped). There is no noticeable dipped beam bias meaning that the headlights are suitable for both left or right hand drive situations.